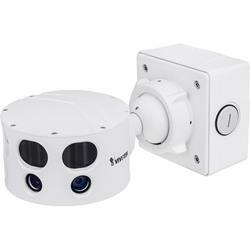 The VIVOTEK MS8391-EV is designed with multiple sensors providing higher resolution, maximizing the field of view and reducing the total number of cameras required, thereby saving on the installation costs. Featuring 4 x 3MP CMOS sensors, the multiple sensor network camera can monitor full horizontal views and deliver high-quality comprehensive coverage, making it an ideal outdoor surveillance solution with sharper images for more details. Covering a wide angle of 180 degrees, the MS8391-EV provides complete video security with no dead angles. By having Multiple Sensors with 12-Megapixel resolution, users can ePTZ across the entire panoramic image for detailed views. With the powerful 3D Noise Reduction and Smart Stream technology, the MS8391-EV can also optimize quality for desired regions to maximize efficiency of bandwidth usage. Additionally, as a professional day/night camera, it adopts a Smart IR technology which prevents overexposure and provides noise reduction to adjust the IR lighting intensity instantaneously based on the changes of light in the ambient environment. Finally, the MS8391-EV is armed with a robust IP66 and IK10-rated housing to enable the multisensor camera to withstand rain and dust as well as to protect against vandalism or tampering.